Menomonee Falls new home builder, Cobblestone Builders receives the BBB Torch Award. Each year since 2004, the Better Business Bureau (BBB) bestows just a few of the top businesses and nonprofits in Wisconsin with the Torch Award for Ethics. Being a recipient is a sign that a company not only trusts in the highly promoted BBB standards but also acts consistently on these standards and incorporates them into their business dealings every day. Cobblestone Builders is proud to have received this award not just once, but twice. In 2009 and 2010 they placed as an Honorable Mention – something very few Wisconsin businesses have done in the fourteen years that the BBB has been giving out these awards. What Does This Mean if You’re Looking for a Custom New Home Builder? It means you found a new home builder you can trust and count on to build the home of your dreams. This statewide award is given only to businesses that practice the highest standards in ethics, honesty, and integrity. It is the most prestigious honor a company can receive from the BBB. So, it means that Cobblestone Builders generates the uppermost level of trust with their customers, between their employees, and among the surrounding communities. Potential customers should feel confident they are working with a one of this area’s best new home builder who has been recognized by the BBB because of their leadership and their commitment to trust, honesty, and marketplace ethics. Cobblestone Builders demonstrates character, high standards, and put their customers, employees, vendors, and communities first. 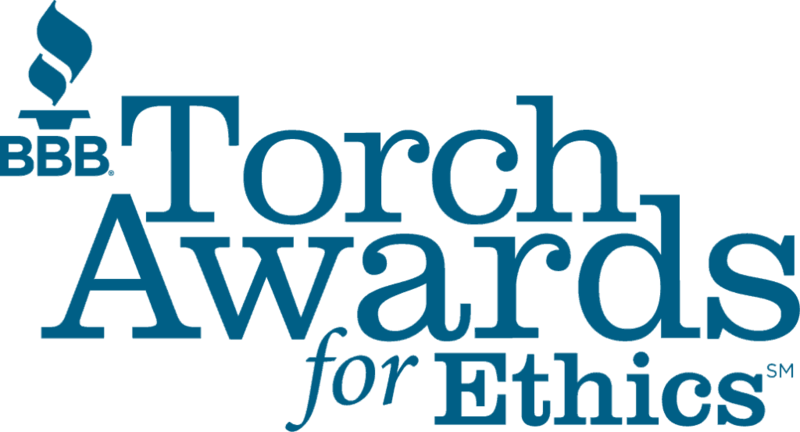 The Torch Awards for Ethics is a national program of the Better Business Bureau. The general public nominates businesses from across Wisconsin and then are vetted by a panel from the BBB Center. In this thorough and demanding competition, companies complete a lengthy application process to demonstrate their commitment to ethics and leadership in the community. All nominees are judged on six criteria: Organizational Commitment to Ethical Human Resource Practices, Organizational Commitment to the Community, Leadership Practices to Organization Unification, Organizational Commitment to Management Practices Involving Performance, Leadership Commitment to Ethical Practices, and Communication of Ethical Practices. One of the latest developments by Cobblestone Builders is Cobblestone Meadows, a new subdivision in Jackson WI in which Cobblestone Builders is offering home and lot packages and welcomes other builders as well. Founded by co-owners (and husband and wife) Dirk and Stevie Wildt in 1990, Cobblestone Builders builds new homes throughout southeastern Wisconsin. With more than 42 years of combined trade and building experience, Cobblestone Builders has a reputation that is unmatched and unequaled. Also, their skilled craftsmen only use quality products and materials. By offering exceptional customer service, and always listening to their customers’ desires and needs, Dirk and Stevie are confident their clients will love the finished product. You can contact Cobblestone Builders here.